This cry for reassurance was moaned by a colleague the other day, and I wish I could say I responded generously. I could have said, “It’s not you, it’s whatever illness is behind those thunderous coughs.” I could have urged him to look after himself, not to worry about us. But I selfishly kept my head down, waiting out the awkward silence. Also, I was afraid of spray. Because let’s get real about the flu of 2018, which has already been deadly and has led to higher rates of hospitalization this year by mid-January versus other years. The difference is that the season has brought more cases of the H3N2 strain of the virus, or influenza A, which was also responsible for a brutal flu season in 2014 and 2015. Public health advocates are urging schools and workplaces to take the flu seriously and to keep it contained as much as possible, which means sick employees should stay home when symptoms develops. But there are always etiquette questions and subtle pressures around taking time off to deal with illness. Here, we answer some frequently asked questions. How should I decide when to stay home? If you’re asking the question, you should probably call in sick, the Mayo Clinic’s Pritish Tosh, an infectious diseases researcher, told the New York Times. Unfortunately, that isn’t an easy answer for people paid by the hour or day, and for those who must spend a portion of their precious personal time off to lay in bed with the flu. More than 30% of of private sector employees in the US receive no paid sick leave, according to the Bureau for Labor Statistics, and those without are on the low end of the wage spectrum. Only three out of 10 in the lowest income quartile are offered paid sick days, compared to nine out of 10 people in the top quarter. That’s a shame, and not only for those employees. Looking at data from Google Flu Trends, economists have found that when paid sick leave becomes a right in a city, fewer people get sick overall. Managers who insist that employees work when they’re ill are only sabotaging their own organization. Working while sick and thus working unproductively (it’s called “presenteeism,” and that isn’t even newfangled management speak) might be costing the American economy $250 billion per year, by some calculations. Am I less contagious after the first few days? No, you’re contagious for one week, and you can infect other people with the flu one day before your symptoms develop, according to the Center for Disease Control and Prevention (CDC). Kids can stay contagious for even longer. To be safe, students and educators should stay away from school for 24 hours after a fever has subsided, the CDC suggests. The same guideline was offered by another doctor who spoke to the Times, though in that case referring to anyone, not only children. Another rule of thumb: You are technically contagious for as long as you have symptoms. How far can spray from a sneeze or cough travel? After looking at high-speed images of sneezes and coughs, as well as conducting lab experiments and mathematical models, Bourouiba found small droplets travel up to 200 times further than larger ones (think centimeters versus meters)—and suspend in the air indefinitely. Should these droplets suspend near, say, an air conditioner, they can be transmitted from building to building, she says. But if I cough into my elbow, it’s fine, right? It’s thought to be better, and it’s recommended by public health officials when a tissue that can be discarded is not available. In 2013, however, researchers at the University of Alberta in Canada tested such protocols, albeit with a small group of volunteers, and measured what happened to pathogens of different sizes when someone who coughed followed standard cough etiquette, including the crook-of-the-arm method. They concluded that it didn’t “block the release and dispersion of a variety of different diameter droplets to the surrounding environment.” Droplets smaller than one micron, or one millionth of a meter, easily got past the inner elbow. Flu germs also jump to others when left to linger on door handles, printer buttons, or other shared tools and furniture. But how does a healthy person die from the flu? Should I go to the doctor for flu symptoms? Yes, try to see the doctor within 48 hours to be treated with Tamiflu, an antiviral medication, Shearer also told Time. But stay away from the ER, he cautioned. You might infect people whose immune systems are already weak. By the way, the symptoms of a flu, according to the Center for Disease Control are: fever, cough, sore throat, runny or stuffy nose, body aches, headache, chills, tiredness, and possible diarrhea and vomiting. But only a swab test to your nose or throat, at the doctor’s office, can confirm that you have the flu and not a cold. I’m not sick. Is it too late to get a flu shot? No! Although the ideal time to get the shot is in October, and there’s a chance this year’s flu vaccine is not as effective as past formulations, getting a flu shot late in the season still offers some protection. Will my colleagues judge me for staying home? [Long sigh.] 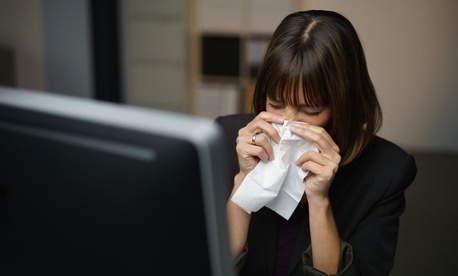 Not only do your colleagues not want to fall ill, some of them may be pregnant, or caring for someone whose immune system is already compromised. So, no. If your company has a compassionate sick day policy and/or you’re able to work from home on days when your symptoms are mild, your colleagues are more likely to judge you if you do show up. Fair enough. About one quarter of Americans say they go to work sick, according to a survey by the National Sanitation Foundation (NSF), a US-based public health research group, and their reasons have to do with workplace pressure, as Newsweek has reported. NSF found that a quarter of people who report for duty sick think their bosses want them there, sickly, feverish and fatigued, or not, and 13% are afraid that things will go wrong without their presence. In some companies and industries, too, employees who call in sick the least often are awarded cash prizes, an incentive system that feels perfectly backwards. Instead, managers ought to be reassuring direct reports that it’s okay to go home, that’s it’s everyone’s best interest. Because here’s what people who muscle through a flu (or expect others to) ought to know, besides the small fact that it can prove fatal: Working while sick seems to have an accumulative effect on your body’s ability to bounce back. In 2009, research from Denmark found that people who went to work sick more than six times in a year (not only with the flu, but other aches and ailments, too) had a 74% chance of falling sick enough to require at least a two-month leave at a later date.